Oil Review Africa, launched in 2006, is published six times a year. A subscription to Oil Review Africa magazine covers the Exploration & Production, upstream and downstream petroleum industry across the entire continent. 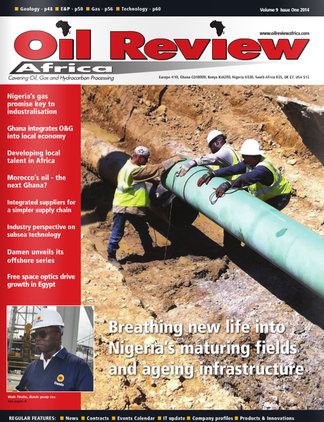 Each issue of Oil Review Africa magazine contains industry news, country reports, sector surveys, technical feature articles, exhibition and conference reviews and news of the latest industry developments and product launches. Oil Review circulation of over 8,000 copies combines authoritative editorial content with an unrivalled circulation throughout the region and has become the magazine of choice among the industry’s advertisers. Oil Review Africa magazine also covers the continents oil, gas and petrochemicals industries. The magazine is distributed to senior, technical and general management within the government ministries, national and international oil companies and leading industry contractors and suppliers. Buy a subscription today to Oil Review Africa magazine today and receive each issue free to your door. Be the first person to tell us what you think about Oil Review Africa and you'll save £2.50 on your next purchase!